Your American Girl ® Doll or 18 inch doll likes to explore the world in any weather. When you go out on adventures or to the movies, make sure she has the perfect coat or jacket for the weather and the occasion. You'll find everything you could want to fill your doll outerwear needs. 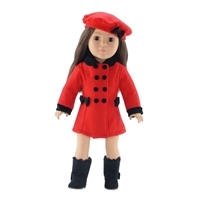 These hand-selected coats and jackets fit all 18 inch soft-bodied dolls, including the American Girl ®, Madame Alexander, Gotz, Our Generation, and Journey Girls.